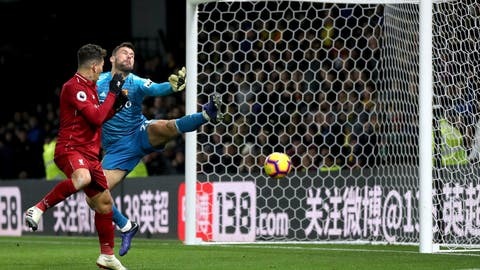 WATFORD, England (AP) — Roberto Firmino ended his English Premier League goal drought and Mohamed Salah also scored as 10-man Liverpool maintained their unbeaten start by winning at Watford 3-0 on Saturday. Trent Alexander-Arnold’s brilliant free kick made it 2-0 after Salah opened the scoring — with his sixth goal in his last seven club games — in the 67th minute from Sadio Mane’s cross. Liverpool will be without Jordan Henderson for next weekend’s Merseyside derby with Everton, however, after the midfielder was sent off for two bookings — the second one coming just after he’d been warned by the referee. It was far from a vintage Liverpool performance but it remained unbeaten in 13 games and two points behind league leader Manchester City.